BeoCare is the leading domestic manufacturer of seamless knitted incontinence and maternity pants for use in the Pant & Pad System. Actually, back in 2008 we were the first company in the USA to offer seamless knit pants as replacement for the old mesh type product. As the domestic market leader we offer the widest range of pants made from polyester, nylon, cotton and spandex. We can develop a custom private label two-piece continence care line for clients based on their particular requirements. Our seamless pants are specifically designed to ensure the absolute dignity of the user and incorporate the highest levels of integrity, function, comfort and aesthetics. In other words they have been designed to look and feel like regular underwear. When combined with the appropriate insert pads, our seamless pants offer superior absorbency for all levels of incontinence. Incontinence companies know that their insert pads are only as good as the pant holding it in place. 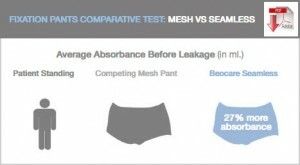 Tests by an independent certified laboratory show that insert pads used with a seamless pant have up to 27% more absorbency, compared to pads used with a traditional mesh pant. The result is more independence, better quality of life and less skin complications for millions of patients worldwide that suffer from incontinence.